Upcoming Gweru based Afro-Pop and Jazz musician, Duvai Munemo has added yet another single towards his yet to be released singles collection with the launch of a new track titled ‘Ndizarurirei Mai Mwana’. Produced by one of Gweru’s budding producers, Samson ‘DJ Smart’ Mawire of 54records, Duvai Munemo better known as Nemo in the music circles, says the song is a plea from revelers to their spouses as the festive season approaches as most tend to drink a lot and lose their monies then find themselves locked outside by their wives back home. “Ndizarurirei MaiMwana is a song about someone who goes out for a drink and gets caught up in the fun and loses his money and comes home late and he gets to find the doors locked. “So in this situation he is trying to explain to his wife what happened and asks for forgiveness,” Nemo says. He says most drinkers will face such situations as the festive season approaches and believes most will identify with the song as they might go through such a situation or have been through it. Nemo is currently working on a 9 track singles compilation album to be titled ‘Nemo Singles Collection’ to be launched before year end. He says more singles will be launched before the final day of completions as the singles continue to seek audience with fans. The man behind the sound, DJ Smart, born and bred in Gweru based in Mambo’s 54Records, says the single is one of his best productions so far this year. 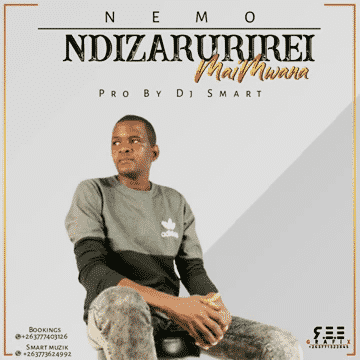 “Working with Nemo is always a great experience and I would say Ndizarurirei is one of my best productions this year,” said DJ Smart. Smart did his music training in Namibia and doubles as a music produce and vocal trainer as well as sound engineer. He has worked with government’s ZimDigital television programme under BlackEnd Productions’ Sitcom NasvilleHeights as an engineer.